'Liberia doesn’t have Ebola any more so we should be allowed to eat bush meat again.' 'We’ve been eating it without any problem for generations.' These are common refrains in Liberian markets, where the trade in bush meat, a known source of the Ebola virus, has picked up once again. As Liberia approaches its two-month mark of being Ebola-free on 9 July, complacency has set in. Monkeys, antelope, raccoons, rodents, bats, and a variety of other animals native to the forests of Liberia, are once again filling market stalls around the country. Sellers, like 35-year-old James Coleman, are increasingly visible once again on the roadside holding out the carcasses of recently hunted bush animals to tempt hungry travellers. Coleman used to do a good trade, but then Ebola came and infected bush meat was suspected of being the source. The Liberian government officially banned the hunting and sale of bush meat in July 2014. The Forestry Development Authority (FDA) said anyone caught with it would be prosecuted and could face time in prison. For a while, the ban worked. People were too afraid of Ebola to consume bush meat and sales plummeted. But now, that fear is gone and customers and vendors are defying the law with growing confidence. At Harbel market in Margibi county, 57-year-old Musu Tomas has been selling bush meat since the 1980s. She stopped during the height of the Ebola outbreak, but has since resumed sales, only to have her products confiscated by local authorities. The skewed logic that because the last outbreak is over, bush meat – still obviously a potential source of future outbreaks – is suddenly safe again, is proving hard to defeat. An FDA official, who requested not to be named, said that in addition to market sweeps, agents are now searching people’s bags and vehicles at various checkpoints throughout the country. While the risk of getting Ebola through bush meat is, admittedly, quite low, according to health officials, it has been the source of many previous outbreaks in both central and western Africa, including in the Democratic Republic of Congo. The ongoing West Africa outbreak, for example, is believed to have started because a young child came into contact with an infected bat in Guinea. But for many Liberians, the reward of profits from selling bush meat – a staple source of protein in the country - outweighs any risk. Many families are also too poor to afford more expensive meats and have little choice but to buy it. “I felt bad when government banned the sale of bush meat on the Liberian market,” Coleman told IRIN. “Though I am not a health expert, I still want to disagree that bush meat has Ebola. We have been eating bush meat since we were born and we never experienced Ebola. Why now?” he asked. Liberian man sells bush meat, post-Ebola. Bush meat is a staple source of protein for many Liberians. Coleman said he hopes business will be even better than before, as, after months of people not killing bush animals, their numbers have increased. He told IRIN that customers are also once again coming to him on a daily basis, eager to eat the meat they love. 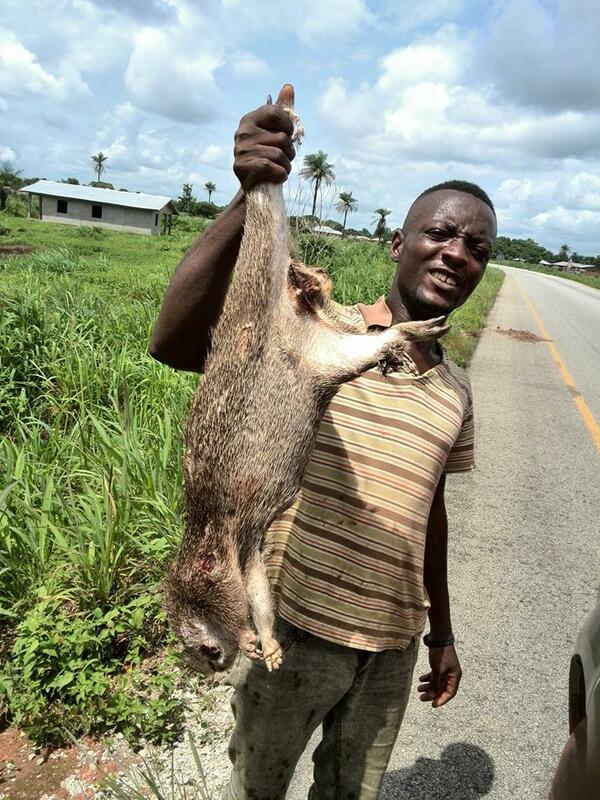 In the past few weeks, Coleman has earned more than $300 from bush meat sales. Forty-two-year-old Korwu Guanue said now that Ebola is gone, she and many others in her area of northeastern Liberia had started eating bush meat again. “The people of Nimba county like to eat bush meat with their native or staple food known as GB [Genba, or ground cassava],” she said, on her way to buy bush meat at a local market. “I was happy when the government said there was no Ebola again in Liberia. The day Liberia was declared Ebola-free I ate a big pan of GB with my children, with enough bush meat.